Well, do you know that one person in your classroom that always gets hundred percent on every assignment? Cheating to Pass or Cheating to Get Ahead? The number of students admitting to cheating has increased significantly over the last 60 years, and students aren’t just cheating to pass, they’re cheating to get ahead. Michael Josephson, the president of the Josephson Institute of Ethics mentioned that students these days are more willing to cheat, and parents, teachers and other authoritative figures are having a difficult time reversing the trend. 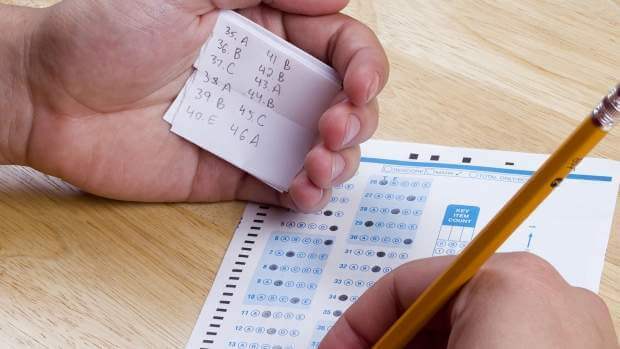 Of course, students aren’t the only ones who are cheating nowadays. Teachers and administrators have also been caught plumping grades and most recently, cheating on standardized tests required by the No Child Left Behind Law. According to the San Francisco Chronicle, 123 public schools in California have been caught cheating on No Child tests in the last three years. Approximately two-thirds of the schools admitted to cheating when questioned about their test results. Is There Any Way to Stop the Cheating? Campbell’s Law, created by social scientist Donald Campbell more than 30 years ago, states that measuring effectiveness with a single influential metric invites corruption. In other words, measuring a student’s performance based on a single standardized test score or one major project/exam per semester encourages unethical behavior. Critics of the No Child Left Behind Law frequently use the argument that if classes were structured differently, perhaps today’s students wouldn’t feel the need to cheat so frequently. This is usually applied to elementary school students but could actually be applied to high school and college classes as well. After all, many of the students who cheat say they feel their actions are justified because the system is structured unfairly or because so many other students are cheating as well. In fact, cheating no longer carries the stigma it once did. According to recent statistics from National Public Radio, two-thirds of parents think cheating is no big deal and say that ‘all students do it’. During an NPR panel discussion on the topic, one caller admitted to cheating – with multiple peers in cahoots – in high school honors classes to get into the best colleges. The caller still upheld the moral fiber of those in the classes, saying that cheating was just something that had to be done to get into quality universities.